PLYMOUTH’S Olympic hopeful David King showed good consistency at the South West Athletics Gala at Exeter on Saturday. King ran two 110m hurdles races against his training partner Valdo Szucs from Hungary, winning them both and clocking almost identical times. The 21-year-old opened the afternoon with a 13.80 second run, with Szucs clocking 14.29. King than ran 13.79 in the second race less than two hours later, with Szucs crossing in 14.15. 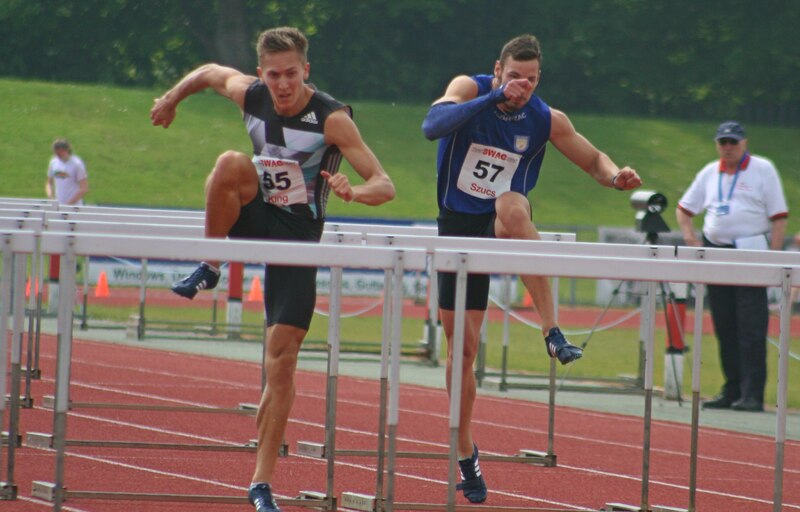 The City of Plymouth athlete, who trains in Bath, ran a lifetime best of 13.54 last weekend when pushed by Great Britain number one Andy Pozzi in Loughborough. That time was inside the European Championship qualifying time and just 0.07 seconds off Britain’s Olympic qualifying standards. City of Plymouth team-mate Jade Simson is also showing good consistency over the sprint hurdles. The 18-year-old went under 14.40 seconds for the third week running in the 100m hurdles. She clocked 14.37 seconds at Exeter when pushed by Sheffield’s Karla Drew, who is currently ranked fifth in the UK. Drew clocked 13.51. The duo later ran 13.61 and 14.46, respectively, in the second race. There was also good performances for fellow City of Plymouth athletes Alex Beechey, Matt Sumner, Lily Edwards and Jonathon Edwards. Beechey ran under 22 seconds for the 200m for the second time this season. He clocked 21.69 to take victory at Exeter, having clocked 22.11 in the first race. Sumner ran 52.98 seconds for the 400m hurdles, with Lily Edwards ran 65.3 seconds to take victory in the same event in the women’s section. Jonathan Edwards won the discus and hammer in 45.81m and 58.24m, respectively. Emma Liardet claimed victory in the under-15 shot and took silver in the javelin. Full results can be found HERE.